Happy Easter all my friends. It has been a glorious weekend. Temperature has been wonderful. My daughter was home from uni for the weekend so this mum is very happy. 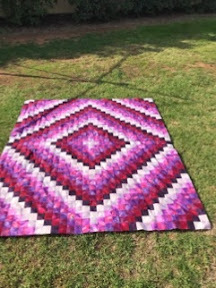 I enjoy using instagram and came across a group, All People Quilt. Anyway they have a year long UFO challenge. You record 12 UFOs and number them 1-12. They draw a number and you can work on that project, you may or may not finish and that's okay. But.... so far for 2017 everything I have listed I have finished. This month is no exception. Number 11 was for the month and I had my Trip Around the World assigned to it. Most of the fabrics were cut out. So I had to finish cross cutting the strips and start making units. I needed nine. So I have spent some time working on this project. I even spent time reverse sewing after joining a section the wrong way. Today I sewed my last unit together and finished the quilt top. I was unsure of how it would fit on my bed but it fits well. I think I am gong to add a dark purple border and bind with the dark purple. But it already hangs over the edge. The quilt is square but being a shorty it is hard to photograph. Now to pull out another UFO. 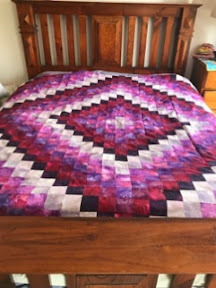 My flannel quilt. Pleased you had a great Easter break with a visit from your daughter. Looks great Simone. 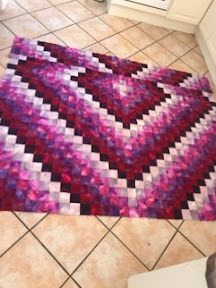 Well done on a quilt top... it's almost finished.